where in we can use both gasoline and LPG. The alternations made to install LPG in the vehicle are discussed. LPG from storage tank comes to the adjustable regulator through a primary delivery valve fitted at the mouth of the LPG cylinder. The gas comes by means of rubber hose to solenoid valve which operates in D.C. electronic current. So a separate battery source is used to operate the solenoid valve. From solenoid valve outlet, separate copper tubes for idle starting and for acceleration are fitted to the carburetor. 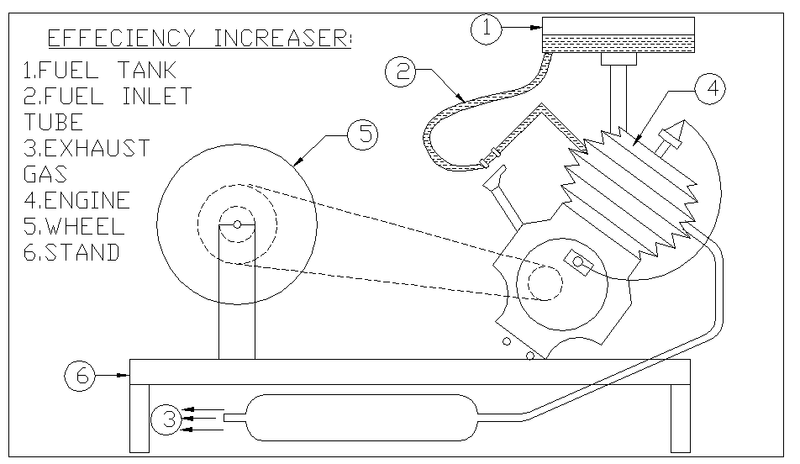 Unlike petrol engine a separate gravity feed lubrication system is made available since lubricating oil cannot mix with LPG to lubricate the various parts of the engine. Another one is chain sprocket is used to increase the efficiency of the Two/Four Stroke engine by providing proper chain sprocket. The chain sprocket is used to increase the rpm. Gasoline is basically a volatile liquid fuel mixture of hydro carbons. As described already it is a by product during the distillation of crude mineral oil and refining it further by other processes. It does not have a fine composition. The constituents vary depending upon the origin of the crude mineral oil. The important properties of gasoline are given below. The air fuel mixture from the carburetor enters the crankcase through the inlet port during the upward movement of the piston. At the same time the mixture in the cylinder is compressed, which is ignited when the piston is just at T.D.C. The combustion takes place and the piston moves imparting motion to the crankshaft. During the downward movement of the piston the mixture in the crankcase is compressed and pushed into the cylinder through the transfer port, which pushes out the exhaust gases through the exhaust port, at the same time filling the cylinder with a new charge fig . This process is called ‘CROSS FLOW SCAVENGING’. Thus the whole cycle is completed in Two/Four Strokes, i.e. one revolution of the crankshaft. The chain converts rotational power to pulling power, or pulling power to rotational power, by engaging with the sprocket. 1. Sprockets have many engaging teeth; gears usually have only one or two. 2. The teeth of a gear touch and slip against each other; there is basically no slippage in a sprocket. 1. It is one of the costliest liquid fuels. 2. Due to its high calorific value, it produces more heat. 3. In gasoline engine, the fuel does not burn completely and hence carbon deposit in the combustion chamber is more. 4. Compression ratio in gasoline engines can not be increased and hence lesser torque is developed. 5. Residue and oil contamination is more as it burns incompletely and hence decreases engine life. 6. It has lesser octane rating. 7. When burns, it emits poisonous gas called carbon monoxide. 8. Due to incombustible gases, the air is polluted. 9. Gum content is more in gasoline engines. 10. Maintenance cost is more. 11. It gives less mileage when compared with LPG. 1. LPG is cheaper than gasoline in cost as well availability. 2. It gives better manifold distribution and mixes easily with air. 3. It is highly knock resistant. 4. Residue and oil contamination is small as it burns early. 6. Due to uniform distribution thermal efficiency is higher. 7. LPG has a higher octane rating making it useful in engines having compression ratio above 10:1. 8. It leaves little or no carbon deposits in the cylinder when it burns. It is a clean gas. 9. Easy cold starting is possible due to thermal motion. 10. It has a low strain on lubricants. 11. Lesser exhaust emission and hence lesser air pollution. 12. High durability of exhaust system. Spark plug and upper cylinder. 13. Since it enters as a gas it cannot wash down the cylinder walls. Thus not remove lubricant and so cylinder wall wear, piston rings wear is decreased. 15. Maintenance costs are lesser. 16. Lean burning is possible. 17. LPG also has an inherent high anti knock value. 18. Due to its less calorific value engine working temperature does not raise much. 19. More mileage by 1 Kg. Of LPG when compared to one litre of gasoline. 20. No need of fuel pump. 21. LPG has minimum gum content. Pls can i get the full synopsis? Hello Good Morning, It will be a great help if you can send me the project synopsis.